Hydrothermal Hydrolysis process includes oxidation of organic matter in Water (sub critical or supercritical) as a reaction medium. The hydrothermal oxidation could be performed by two processes. Wet air oxidation (WAO) is a relatively low temperature (120ºC to 300ºC) and low pressure (1–10 MPa) process. The process brings together the waste and the oxidant Streams under suitable oxidizing conditions. Sludge’s can be conditioned at low temperatures and oxidized to high level of destruction (80–85%) at higher temperatures. In WAO, the proteins, lipids, starch and fibers that make the sludge solids are converted into simpler dissolved compounds, such as sugars, amino acids, fatty acids and ammonia. WAO is an aqueous phase process in which soluble or suspended oxidizable Constituents are oxidized by dissolved oxygen. Oxidation reactions take place in the Aqueous environment where the water is an integral part of the reaction. Water provides a medium for the dissolved oxygen to react with the organics and can also react in part with the organics. It is theorized that the chemistry of wet oxidation involves free radical formation with oxygen derived radicals attacking the organic compounds and resulting in the formation of organic radicals.51,52 Catalysts, such as homogeneous Cu2+ and Fe3+, their heterogeneous counterparts, or precious metal catalysts can be used to enhance the effectiveness of the WAO reaction.28,49,53-60. A noteworthy characteristic of wet oxidation chemistry is the formation of Carboxylic acids in addition to the primary end-products, CO2 and H2O. The yield of these carboxylic acids varies greatly depending on the design of the WAO system, but typically 5-10% of the total organic carbon (TOC) from the feed stream remains as carboxylic acids by-products, predominantly acetic, formic, and oxalic acid. Should These compounds are undesirable, and then a more rigorous treatment at high temperature and/or catalytic operation can be used. As a practical matter however the carboxylic acids are biologically degradable and conventional biological post treatment of the WAO effluent is often the most cost effective approach. If present, the elements, nitrogen, phosphorus, sulfur, and chlorine are usually reacted to NH3, PO43-, SO42-, and Cl- respectively. The chemistry of wet oxidation has some attractive properties with regards to the Off-gas produced. The off-gas from a WAO reaction has negligible NOx, and SOx and Negligible particulates. Volatile organic compounds (VOCs), such as aldehydes, ketones, and alcohols may be in the off-gas depending on the composition of the feed stream. When VOCs are present, thermal oxidation is usually used for treatment of the off-gas. 1. The waste is pumped through a high-pressure pump; this can be a standard Reciprocating diaphragm pump for liquids or a more exotic high pressure pump for Slurries. The oxygen for oxidation is supplied by either air or pure oxygen and in this General flow scheme an air compressor is shown. The air is combined with the liquid and they pass through a feed/effluent (F/E) heat exchanger (HX) where the fluid is heated to near reaction temperatures. The two phase fluid then flows into the bubble reactor where the exothermic reaction takes place. The usual retention time in the reactor is 1 hour. The oxidized effluent and off-gas then pass through the hot side of the F/E HX to be Cooled while simultaneously heating the influent. Auxiliary heaters and coolers are also employed (not shown). Depending on material of construction constraints, steam balance desires, or other factors, separate heat exchangers rather than an F/E HX have been used. After cooling, the wet oxidized effluent then passes through a pressure control Valve that controls the pressure on the WAO system. A separator downstream of the Pressure control valve allows the depressurized and cooled vapor to separate from the liquid. The liquid is discharged, typically to conventional biological treatment facilities for final treatment. The gas is usually vented to some form of thermal oxidation such as a boiler or a dedicated flare header. The wet oxidation reactions usually take place between 100°C and 372°C at Elevated pressures to maintain water in the liquid phase. This temperature range can be further subdivided into low (100-200°C), medium (200-260°C), and high temperature (260-320°C) operation. Higher temperature (320-372°C) systems can be designed as well but are rarely used due to the high capital cost. Due to the necessity to maintain water in the liquid form, the system pressure is maintained above the steam pressure. Because steam pressure increases with temperature, the terms such as high temperature and high pressure are used interchangeably. Figure 2 is a diagram of the typical no catalytic WAO waste treatment application spectrum. The SCWO process occurs at temperatures and pressures above the critical point (374.2ºC and 22.1 MPa). Water becomes a supercritical fluid at temperatures and pressures above the critical point. Supercritical water (SCW) may be viewed as a transition state between the liquid and gas phases. Within the critical zone, the liquid and gaseous phases merge resulting in one phase, or supercritical fluid. The supercritical fluid has unique characteristics, some of which are highly useful for the hydrolysis and oxidation of complex organic waste streams. Oxygen is completely miscible in SCW . The initial SCWO research efforts were focused on developing an effective hazardous Organic waste treatment process capable of achieving 99.9999% removal efficiencies. 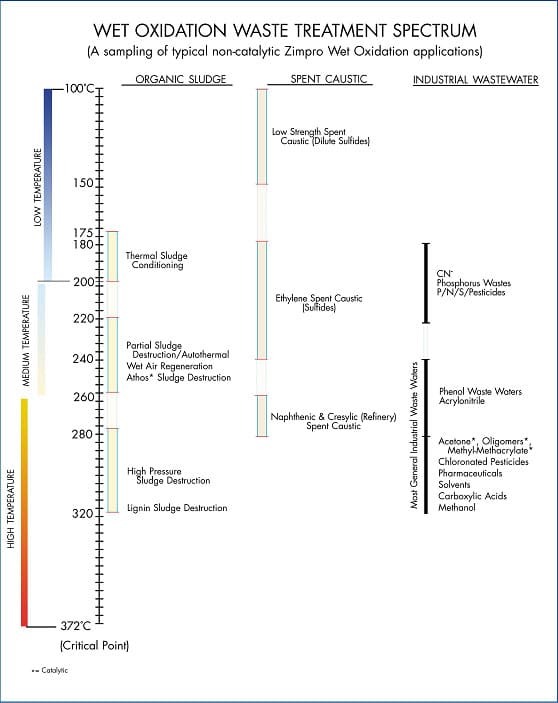 The various organic components of sludge undergo two major hydrothermal reactions: decomposition (mainly hydrolysis) and oxidation. 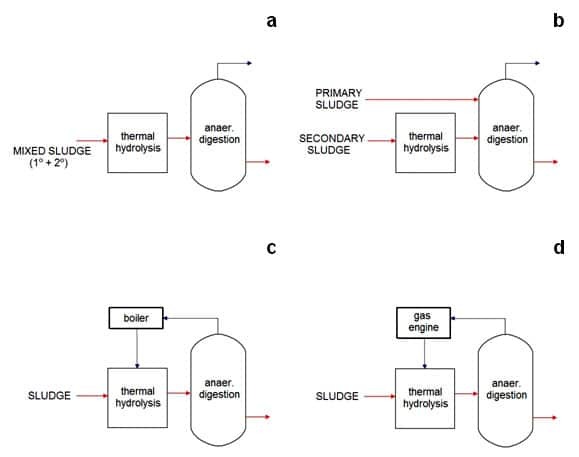 Hydrothermal decomposition of the complex organic component of sludge results in the formation of simpler organic products, such as sugars, amino acids, and fatty acids. Hydrothermal oxidation results in the formation of oxygenated intermediates and final oxidation products, such as CO2 and H2O. The model in Figure 1 represents hydrothermal decomposition and oxidation. The final hydrothermal oxidation products of the initial complex organic matter (represented by C, H, N, O, P, S, CI) are shown in Eq. 1. The process raises the P, S, and Cl atoms in the waste to their highest oxidation state. Nitrogen products may include ammonia, nitrogen gas, nitrates, and nitrites depending on the original form of nitrogen in the waste and the reaction conditions such as temperature and pH. C, H, N, O, P, S, Cl+O2®CO2+H20+PO43–+ Cl– +SO42–+(N2+NH4 +NO2 –+NO3 –)+Heat (1) Mass and settled-volume reduction. The destruction of the solid organic component of sludge, which mainly consists of proteins, lipids, hydrocarbons, and crude fiber, is rapid and proceeds through hydrolysis and oxidation. Hydrothermal treatment can result in significant mass reduction, depending on the organic component of sludge (typically 60–80% VS/TS). A simplified schematic of a hydrothermal treatment system is presented in Fig . The System utilizes a pre-heater, reactor, solid-liquid separator, and cooling/energy recovery exchanger. The pre-heater utilizes some of the energy in the effluent to heat the influent. 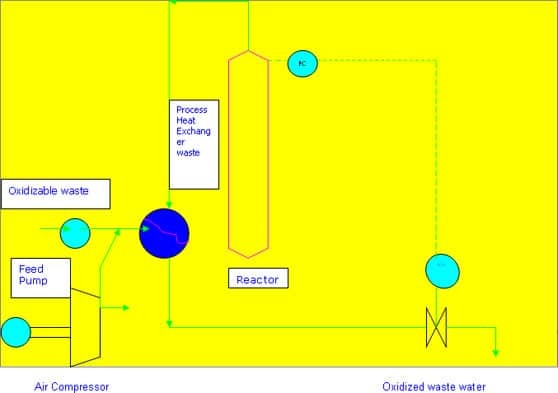 Introduction of the oxidant into the preheated waste stream causes a rapid rise in temperature and an aggressive oxidizing environment within the reactor. The heat exchange/ recovery units are particularly susceptible to scaling and corrosion. The corrosion issue may not be a major concern with sludge’s compared with halogenated waste streams. SCWO In general, the most suitable materials for SCWO reactions are expensive and usually lack structural integrity. However, the acceptable corrosion resistant materials can serve as reactor liners. In addition to corrosion, pressure letdown devices are susceptible to erosion as a result of suspended solids in treated effluents. Solids separation prior to effluent discharge can help reduce erosion of pressure letdown devices. Another challenge associated with process development relates to scaling. The deposition of salts on the walls of the reactor and heat exchange devices results from the inability of the low density SCW to dissolve inorganic salts, which drop out of solution treatability testing to select the most suitable range of reaction temperatures, pressures, residence times, and oxidants. As with incineration, SCWO can achieve virtually complete oxidation of the organic component of sludge. However, the major advantages of SCWO as compared to incineration relate to applicability to relatively dilute waste streams and quality of air emissions. The process can meet stringent regulatory requirements for air emissions without the need for extensive air pollution control devices. This feature reduces the operating costs of SCWO compared to incineration. The SCWO process is best suited to treat waste streams that contain adequate organic content to generate enough heat to sustain the reaction temperatures. Highly concentrated waste streams can result in overheating. Sludge’s thickened to 5–10% solids content can provide the best treatment economics as thickening reduces the required reactor volume and allows the generation of enough heat to sustain the reaction. On the other hand, sludge incineration requires efficient dewatering and drying of sludges and the addition of auxiliary fuels to sustain the reaction temperature. Scheme A: No feed segregation: mixed sludge to the TH unit. Scheme B: Feed segregation: only secondary sludge to the TH unit. Burning the biogas in a boiler to produce power. The waste is pumped through a high-pressure pump; this can be a standard Reciprocating diaphragm pump for liquids or a more exotic high pressure pump for Slurries. The oxygen for oxidation is supplied by either air or pure oxygen and in this General flow scheme an air compressor is shown. The air is combined with the liquid and they pass through a feed/effluent (F/E) heat exchanger (HX) where the fluid is heated to near reaction temperatures. The two phase fluid then flows into the bubble reactor where the exothermic reaction takes place. The usual retention time in the reactor is 1 hour. The oxidized effluent and off-gas then pass through the hot side of the F/E HX to be Cooled while simultaneously heating the influent. Auxiliary heaters and coolers are also employed (not shown). Depending on material of construction constraints, steam balance desires, or other factors, separate heat exchangers rather than an F/E HX have been used. After cooling, the wet oxidized effluent then passes through a pressure control valve that controls the pressure on the WAO system. A separator downstream of the pressure control valve allows the depressurized and cooled vapor to separate from the liquid. The liquid is discharged, typically to conventional biological treatment facilities for final treatment. The gas is usually vented to some form of thermal oxidation such as a boiler or a dedicated flare header.